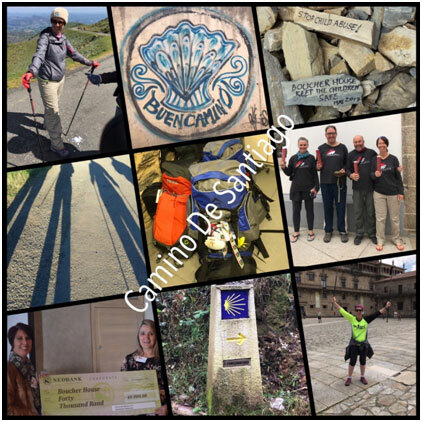 **Summary: Our Camino actually started in August 2015 when our friend, Sally asked us if we’d be keen to walk the Camino. The seed was sown and in November 2015 we joined Run Walk For Life and started walking three days a week. Our first walk at RWFL was 3 km and we wondered if we’d ever make the 10 km mark. Fast forward 18 months and we were packed and flew out of Cape Town for Paris on 26 April ready to take on the Camino Pilgrimage as Perigrino’s (pilgrims). Together with my husband, Wayne and our friends, Sally and Pete, we departed from St. Jean-Pied-De-Port, France on 28 April and walked for 33 consecutive days, arriving in Santiago on 30 May 2017. We all walked for charities that were close to our hearts. My chosen charity was Boucher House which was founded 10 years ago and is a home for abandoned and neglected children. The children are raised in a loving and nurturing environment and are afforded opportunities that they would otherwise have been deprived of. The personal joy it brings to see their faces light up with smiles when we visit them, is priceless.